As families grow and new generations are born, it’s important to keep the family ties strong. Traveling together can help. But planning a multi-generational getaway that will keep everyone in your family happy can be challenging. Finding the right location is key—and Lancaster County, Pennsylvania is ideal. Located in the heart of Pennsylvania Dutch Country, Lancaster County has a wealth of activities to please every generation. From outdoor adventures and cultural experiences to some of the best antiquing in the country, this is a place where every family member will come away with treasured memories. I’m a big proponent of connecting with the local culture no matter where I travel. As home to the country’s oldest Amish settlement, Lancaster County provides an ideal destination to learn more about the Amish culture and way of life. 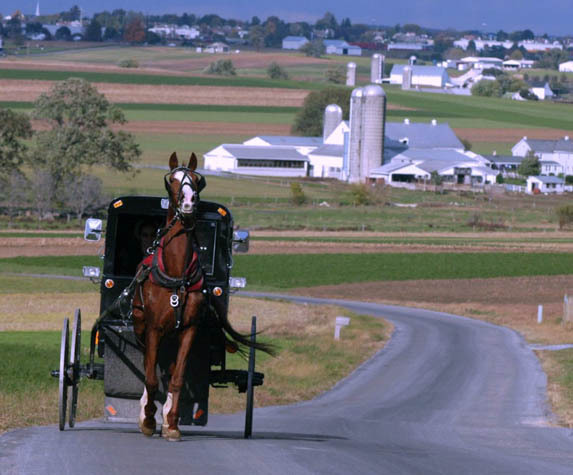 An Amish buggy ride through the bucolic landscapes of Lancaster County provides a non-intrusive glimpse into this intriguing culture. My grandkids were fascinated by the lifestyle and dress of the Amish—and even more surprised to learn that video games are not an option for Amish children. Lancaster County has an abundance of farmland which means the local wildlife primarily consists of cows, horses, goats, pigs, sheep and alpacas—not a bad round up. For the equestrians in the family or even first time riders, a horseback ride at Ironstone Ranch is a must. Situated on 275 acres of scenic farmland and woodlands, 10 miles of trails offer options for the beginner to the experienced equestrian. Trot through history as you ride down the original railroad bed where Abraham Lincoln’s Funeral Train and the Liberty Bell once traversed. A highlight along the route is the Star Barn. This fully restored Gothic Revival-style Star Barn has been a landmark on the Central Pennsylvania landscape since 1877. It stands—along with the Star Barn Complex of agricultural structures including a carriage house, hog barn and chicken coop—as a reminder of the region’s rich agricultural history. If you have a weakness for the adorable faces of South American alpacas like I do, be sure to visit Eastland Alpacas to spend a few hours with these intelligent, gentle and curious creatures. While you’re there you can pick up an assortment of scarves, mittens and hats woven from the ultra-soft alpaca fur. In the northeast corner of Lancaster County, the antique lovers in the family will be delighted to find the Antiques Region. Home to thousands of antique shops and dealers, the treasures from days gone by range from fine furniture to historic postcards and everything in between. Lancaster is even recognized as the premier year-round antiques destination in the Northeast. And for the art lovers, follow the Lancaster Art Trail to explore the county’s eclectic collection of art galleries. While some of my family members lean toward fine art, others prefer hand-made pottery or stained glass creations. Lancaster has it all from city to country, contemporary to classic. When you’re traveling with kids, you want to be sure to include memory making experiences—and if those experiences include a little sugar, even better. We found our sweetest adventure at the Turkey Hill Experience. This 17,000 square foot facility filled with interactive exhibits exploring dairy culture and the story of the Turkey Hill Dairy was a huge hit with my grandkids. It wasn’t the history that won them over—it was the interactive ice cream making experience. In the Taste Lab we created our very own ice cream flavors with an assortment of oh-so-sweet toppings. It was a delicious good time and the only challenge was keeping the kids from eating their weight in ice cream. We also created a virtual ice cream flavor and the kids even recorded their own ice cream commercials. If your family is anything like mine, despite your diverse interests you’ll have one thing in common: a love of good food. With such lush farmland, Lancaster County has always embraced the farm-to-table concept. Head to Lancaster’s Central Market to sample produce fresh from the fields, succulent fruits, local meats and cheeses, and the sweetest baked goods. Downtown Lancaster has a nice variety of fine dining options too including Ma(i)Son—an urban cookery with a farm focus. Using the best ingredients sourced from Lancaster County and the Susquehanna River Valley, Ma(i)Son defers to the culinary traditions and techniques of the old world. The menu is small, simple and changes weekly. And the food? Well, you won’t find anything fresher. Have you visited Lancaster County with your family?